The Human Dolphin Foundation ( a non-profit 501 c 3) was started in 1976 by Dr. John C Lilly MD, a neuro physiologist studying the brain. Looking for an intelligent being to develop a model for interspecies communication he discovered that dolphins specifically Tursiops Truncatus, had large and highly complex brains and went on to pioneer two way human dolphin communication. The Human Dolphin Foundation has now expanded its mission to include the health of our water planet as a whole, specifically the Pacific Ocean area. This includes conservation research and education about cetaceans including Humpback whales and the monitoring of ocean water, with an emphasis on facilitating stewardship to a younger generation. In order to understand current stock assessments and the status of Common dolphins, Spinner dolphins and False Killer Whales the species most commonly found around the Hawaiian Islands we are encouraging Citizen Science as an adjunct to scientific study. If you live in Hi. and have encounters with wild dolphins while you are swimming or boating, under the dolphin database link you will find a simple questionnaire which will help us acquire current and up to date data. Our colleague Cynthia Matzke has just returned from a ten day expedition to the Mariana Trench aboard the The Research Vessel Falkor. 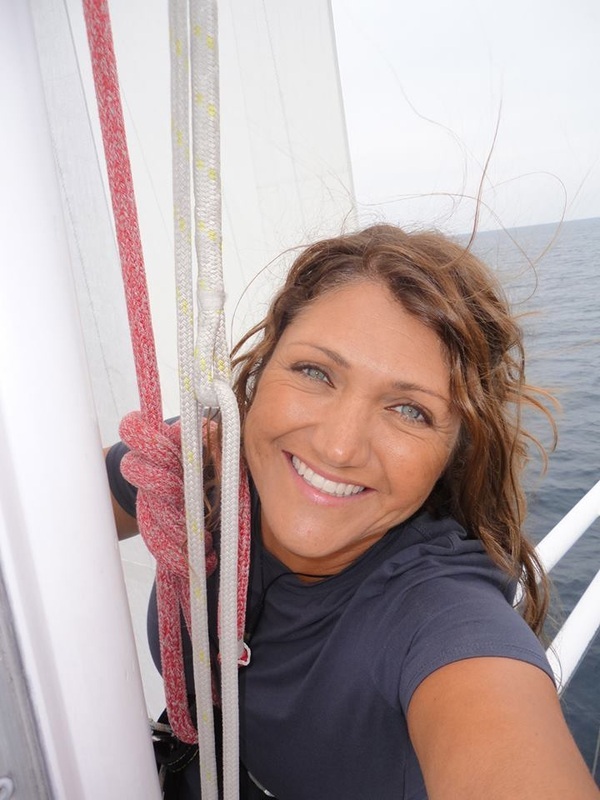 Her full blogs about the expedition can be seen on Facebook at " Spiral Pacific: Exploring Ocean Ecosystem Connectivity." Before she left she contacted Don Walsh who along with Jacques Picquard was the first person to descend into the Trench in the 1960s. James Cameron followed in 2013 in Challenger Deep. The object of this expedition was to launch Deep Sound - the nearly silent acoustic monitoring device that descends in free fall to the bottom of the trench. HDF was delighted to support Cynthia in this endeavour. On our second day perched above Challenger Deep, the expedition is in full swing. Teams are working ‘round the clock as landers are deployed. Chief Scientist Doug Bartlett and the various lab groups prepare for the incoming samples and data, and they work with the ship’s crew to create a safe and efficient flow. This is a short cruise, so protocols are sorted quickly to maximize sea time. Heavy machinery grinds as it lifts and launches the massive lander units, directed by cool heads and skilled hands. The trade winds maintain the 3-meter-high seas that have not relented since our arrival. Once the landers pass the rough surface zone, they can slowly begin to make their historic descent into still darkness. Last night two of the free-falling “Deep Sound” landers from Michael Buckingham’s lab were sent down. Deep Sound 2 and 3 have undergone progressive improvements, with each generation incorporating changes to allow for different hydrophone configurations, and increased depth ranges. They drop nearly silently to pick up ambient noise patterns, which can provide insight into physical characteristics of the environment such as sound velocity and characteristics of the sediment.Yesterday we also deployed the ARI lander, which was equipped with instrumentation and baited to potentially capture the ‘gigantic’ fauna near the bottom, namely amphipods. These are crustaceans that resemble white sand fleas. Some have been known to grow to over 20 centimeters (~8 inches), compared to the 1-millimeter-sized species that live in shallow waters. It’s still unknown how many amphipod species live in the hadal zone, a question more research can hopefully answer. This morning just before dawn, Deep Sound 2 surfaced after a successful dive to its target depth of 9,000 meters. The sound data will be transferred over the next several days by David Barclay and Dieter Bevans. Deep Sound 3 was supposed to dive to over 10,000 meters and ascend several hours after Deep Sound 2, but it never surfaced and its whereabouts are unknown. The ARI lander was expected to resurface by midmorning, but we lost communications with it and it also has not been recovered. The scientific process is about learning what works and what doesn’t, yet these setbacks are still disappointing—especially since working in such an extreme and inaccessible environment means the root causes of these problems may remain unknown. This afternoon Matt Norenberg and Dave Price reconfigured the Leggo Lander with a camera and baited trap, in hopes of drawing in the deep-sea life. The first deployment was designed to draw animals into the Nisken bottle, and although it closed properly and collected water samples, no animals were inside. This next deployment has a slightly different goal: to capture amphipods and sea cucumbers on film and in a trap. Sea cucumbers have never before been collected at this depth, but images of them may have been spotted on video from the James Cameron Deepsea Challenge expedition, making researchers hopeful. For this drop, microbial contamination is not an issue so chicken, beef, and a mackerel were added to the menu as bait—a deluxe surf and turf platter for discerning hadal palates. The internal video camera will record the initial descent from the surface, then will shut off for the 5 hour drop to the sea floor. The lander will be at about 10,900 meters (~35,750 feet) for over 6 hours, with lights periodically turning on to surprise and record any visiting snackers. If all goes well we should retrieve Leggo by morning, hopefully with video footage and maybe even a sea cucumber inside. Allison Miller has said that’s all she wants for Christmas. Check back with us tomorrow to see if her wish came true. 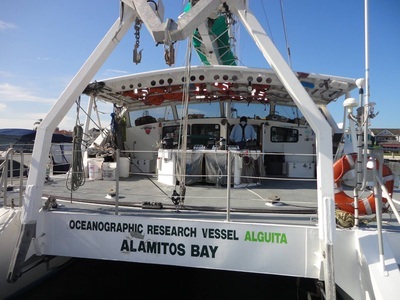 Algalita Marine Research Institute (AMRI) is a Long Beach, California-based non-profit marine research and education organization, dedicated to the protection and improvement of the marine environment and its watersheds through education and research on the impact of plastic pollution. ﻿Cynthia Matzke﻿ is part of its crew and in July heads to one of the most polluted areas of the world. This place, 1,000 miles away from land, redefined Algalita's mission and ignited a fire to study the plastic plague destroying our oceans. This is the North Pacific Gyre, home of the swirling vortex of plastic trash. The Algalita's founder, Captain Charles Moore, discovered the “plastic soup” in 1997. The Algalita team will journey to the center of the widely known "Great Pacific Garbage Patch." There, they'll conduct an intensive 30-day exploration of how plastic pollution has affected the marine environment. The persistence and increasing quantity of plastic debris has created new habitats—essentially “plastic reefs” that sea creatures have made their homes. How have these artificial ecosystems changed the Gyre since our first expedition 15 years ago? What have they done to the various species in the area? And what consequences do "plastic reefs" have on human health? Algalita's scientists will look for answers. Through analysis of water, fish and invertebrate samples, they'll work to find conclusive data. Specifically, they'll take plastic debris samples from the same stations we sampled in 1999, 2008 and 2009. The ultimate goal is to evaluate long-term trends and changes in the Gyre by merging the data from previous expeditions with new data. For 30 days, the crew will live aboard the Oceanographic Research Vessel, Alguita, in order to get an extended, close-up view of the plastic debris in this famous accumulation zone. Algalita will allow thousands of students from around the world to connect virtually with its team. Through Algalita's Ship-2-Shore Program, students can communicate with the crew in real time using satellite communication systems. Real-time whale recordings from Big Island near Kona. Not always online but when it does realtime matching video. Trilogy Blue Aina Dec. 22 2013.- Kerri Seger of Scripps Inst. teaches local children how to program and deploy Humpback Acoustic Monitor. UPDATE: Cynthia Matzke is now attending Scripps Institute, La Jolla, taking an accelerated Masters Degree. 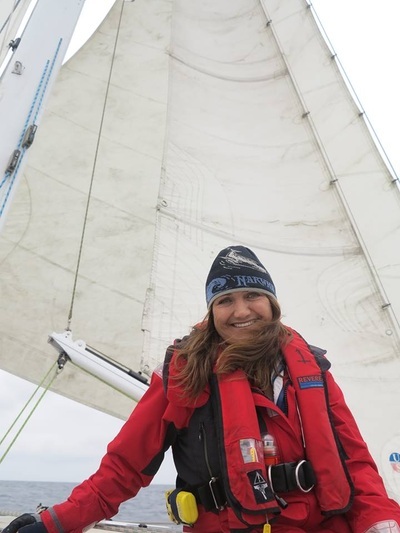 As well as her ongoing plastic debris and water quality research, she is currently working with on Humback Whale Acoustics in the Alaskan feeding grounds and also in the ocean off Maui, Hi. in March. She is also studying and documenting the effects of large landbased developments on the adjacent seed reef at Oluwalu. Human Dolphin is partially supporting this research. Human Dolphin Foundation thanks Trilogy Excursions, Keone Electric and NOAA Sanctuary Foundation and the Blue aina Campaign for their support and donation. We have been working on Trilogy's Blue Aina for some time. It is a reef clean up that offers a wonderful reduced price trip on one of their fabulous new clean catamarans for locals and tourists alike. We sail to one of the many beaches and coves along the coast and then snorkel and dive the reef to pick up fishing line, auto parts and other plastic trash from the reef. The ticket price is then donated to a different local non profit every month. It is a wonderful way to get to know local volunteers and introduces tourists and new imports to the opportunities for citizen science and other ways to help out in the islands. 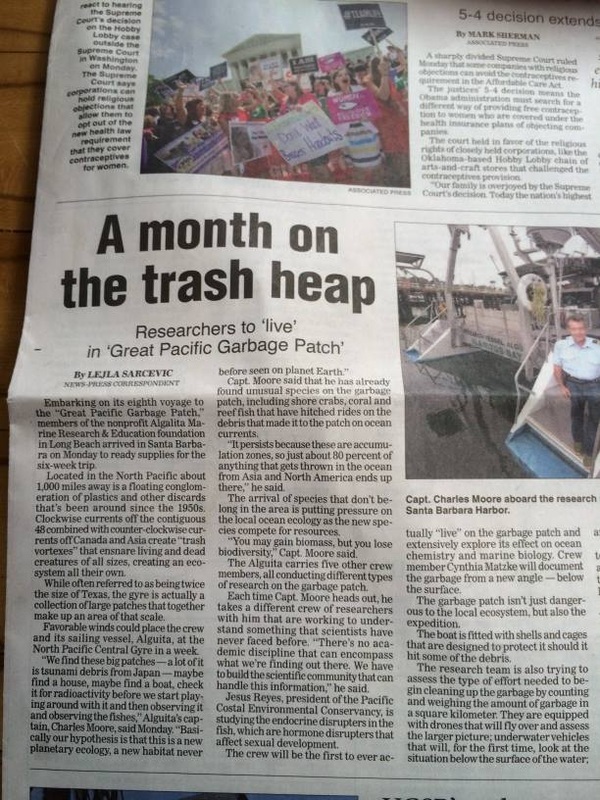 Trilogy volunteers crews and boats and have been cited by mayor of Maui Alan Arakawa for their outstanding ecological efforts. Trips are usually bi-monthly and cost $25 which includes a three hour boat trip and food. May 6 - The meals are getting weirder with random supplies left and not much fresh food. We do still have some strange local squash though, and joke about it often but still nobody wants to cook it. It's already been a staple for the last 2 weeks. There was not much fresh produce in the Marshall Islands so we took what we could get. SQUASH this! Today we found a big net raft, which was super exciting and a highlight to the trip. We got to hop in the water and I got to film it (one of the first allowed in, as sharks were a big concern.) Sadly, no sharks. Just a big death ball, with dead fish plus some smaller live ones rafting around it. Then we brought it aboard to extract and analyze many of the different species that have made it their universe. I brought out the geiger counter and took a reading -- OMG a 90! A normal reading is between 18 - 30, so it may be cause for concern. I'm putting in calls and hopefully will know by tomorrow if we have to get it back off the boat, which would be negative for the ocean as the death trap would continue it's killing spree. May 14 - Things here in the gyre are going well. We've been seeing a lot more plastic trash over the last few days. We're still 1,000 miles south east of Tokyo and just leaving the 30 degree 'horse latitudes.' Thankfully the wind has increased and we're making some headway again without the motor. The other day we came across a ghost net ball floating at the surface. 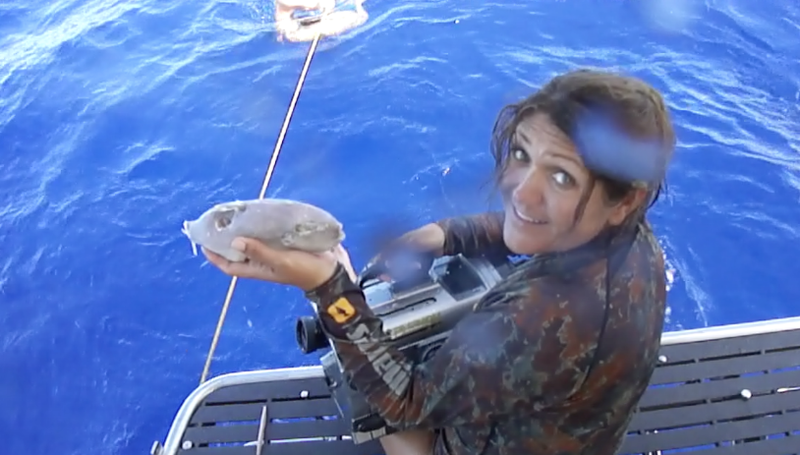 As with many 'rafts' it became the home to many wayward critters, including crabs, barnacles, frogfish, and a blenny. I got some great footage of it in the water, then we pulled it onto the boat to take a closer look. When I used my geiger counter to get a reading, it came out a 94 - three times higher than normal. But I contacted my scientist friend, and with exposure to it for a week we will be OK.
Just a short note to let you know I'm alive and well here in the gyre. We're 1100 miles out, and about half way through our trip. I'm learning a lot and adapting well to life at sea on a sailboat. The other crew members are great - I'm surrounded by a very talented and eclectic bunch. It's an honor to be here. Our trawls are producing a lot of plastics, though we haven't got to the heart of the plastic debris accumulation zone yet. The images won't necessarily be dramatic - what is shocking though is how much tiny bits of plastic are everywhere, throughout the water column and permeating the sea itself. I am learning much about the science of collecting the samples. The weather has been reasonably good - very hot and humid in the tropics but now we are heading north and expecting much cooler weather. More squalls and rain expected, but I actually welcome it. Having issues with producing our fresh water here on the boat, so a good rain shower would be nice. I will write more as time allows. We’re trawlin! We did a test trawl in Majuro Atoll to make sure it all works. The trawl is a 60cm wide net with a 333 micron mesh, roughly 1/3 of a mm. It’s smaller than the holes in your t-shirt. We drag it across the sea surface for exactly 60 minutes and record the exact distance we’ve gone, but also the speed on the knot meter. We’re measuring particles of plastic per square kilometer by skimming the surface layer of the ocean. We’ll do this over 100 times in the next 2 months as we sail from Majuro Atoll to Japan (3000 miles), then Tokyo to Maui (4000 miles). Follow our blog to see what we find! The fun-raiser was a wonderful success to send Cynthia Matzke on her Pacific Trash Gyre Trip. Thanks to everyone who helped especially, Moki Chung, Kaau Abraham, Rick Long, Giselle, Ahumanu, Capt's Chris a Martin and Jeff, Wailea Massage, Kendrick, Deanna and all those donors and participants. Great evening. Here is the best link for following the Sea Dragon and Cynthia' s progress to the plastic gyre www.algalita.org/blog Algalita Foundation and The Five Gyres Foundation are now preparing for their 2014 Gyre Expedition. Fundraiser for research expedition to the Western Pacific Trash Gyre. The boat chartered by the Algalita Marine Foundation will leave the Marshall Islands on May 1st heading to the Western Pacific Trash Gyre where it will take samples and document it. The boat will then move on to Toyko through the tsunami debris where it will sample and document that in an effort to understand the problem and project trajectory. Human Dolphin is supporting these efforts and is helping raise money to send Cynthia Matzke a local Maui diver, marine biologist and environmental activist on this trip. The second leg of the trip returns from Tokyo to Maui arriving July 1st where there will be welcoming events for the expedition at Malaa Harbor. There are now five Trash Gyres on the planet. North and South Pacific and Atlantic and the Indian Ocean. Silent Auction, Music, pupus and information. Tickets $25 at door. Project Janus. Joint Analogue Numerical Understanding System. Toni Lilly obtained a donation of Mac computers from Steve Jobs and Burgess Meredith obtained the support of Joe Levine who produced The movie Day of the Dolphins starring George C Scott and Trish Van Devere based on Dr. Lilly's work in the Virgin Islands. Joe Levine and Burgess Meredith obtained two very young dolphins and the JANUS Project started at Marine World/ Africa USA. Dolphin sounds that occur in ultrasound up to 200 Khz are too high for humans to hear but with the help of computer software, signal analyzers, frequency down-shifters, hydrophones, Apple II and Digital Equipment PDP 11/04 computers, Project Janus aimed to develop a 40 word, tone generated vocabulary. A third language neither English nor Delphinese..
HDF considered the initial aim achieved but after several years the staff and volunteers of The Human Dolphin Foundation including; Jennifer Yankee, Tom Fitz, John Kert, Ed Ellsworth, Roberta Goodman, Barbara Clarke-Lilly and Marthe Spence among many others voted to re-adapt the JANUS dolphins, Joe and Rosie to the wild. In the first ever legally approved re-adaptation by National Marine Fisheries Services. With a donation from Brad Green one of our dedicated interns and with the help of ORCA under the guidance of Gigi Coyle,and Abigail Ailing, they were returned to the coast of Georgia close to where they were captured. Ric O'barry former Flipper trainer, now tireless anti-captivity activist and main man in the recent Oscar winning documentary 'The Cove' worked with the dolphins in Florida teaching them how to catch live fish from a salt water holding pen. They were freeze branded on their dorsal fins (a non intrusive method ) and swam off to freedom. They were sighted several times first alone and then with a larger pod in the coming year. A DVD which includes working session tapes of JANUS, videos of the dolphin lab in St. Thomas and release program, will soon be available for download from this site. Dr. Lilly spent the last ten years of his life in Maui, HI. PLASTIC PACIFIC GYRES, GARBAGE PATCHES AND TSUNAMI DEBRIS. HDF is now raising donations to send our colleague Cynthia Matzke on a research voyage with the Algalita Marine Research Foundation to the Marshall Islands and Japan to study the Northern Pacific and Subtropical Plastic Gyres and Tsunami Debris resulting from Japan's massive earthquake in March last year. The Algalita Foundation was started by Captain Charles Moore after he encountered one of the garbage patches in 1994. There are now five known such patches throughout the world. Cynthia who works for Trilogy Excursions in Hawaii has been running their award winning Blue aina reef clean up program. She is a marine biologist and underwater photographer. 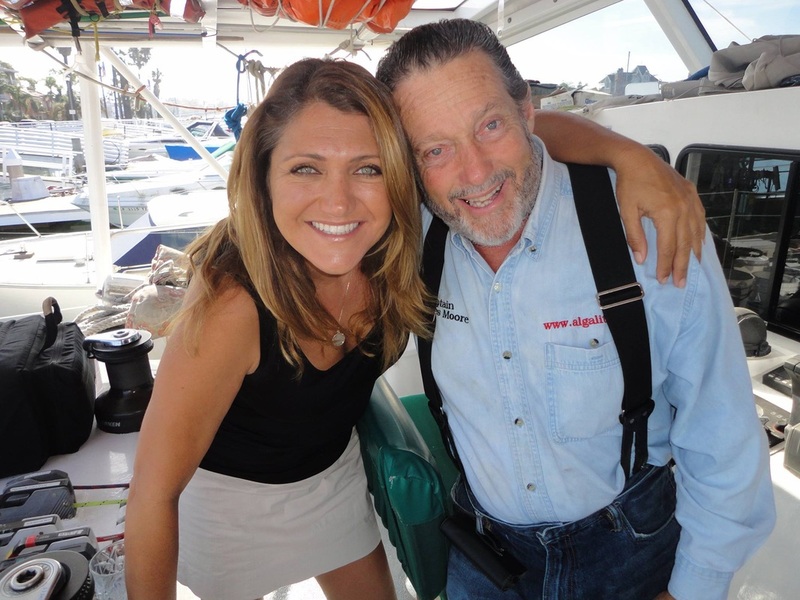 She has worked with Jean Michel Cousteau and Dr. John Lilly among many others and is a dedicated ocean conservationist. She has been chosen to be part of this expedition but has to fund also. This will be no pleasure dive. Effects of extensive nuclear testing around the Marshall Islands are just now being studied and research on tsunami debris from Japan is a new field. Although plastics can break down into smaller and smaller pieces, these islands of trash attract colonies of fish and seabirds. When algae starts to grow on the outside of the small pieces, the animals mistakenly eat the plastics and die. 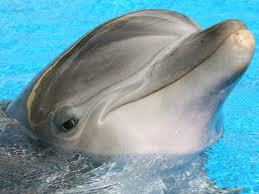 Stock assessments for Spinner Dolphins are approx 2,800 and for Bottlenose Dolphins 3,200. Spinners are smaller, 6' - 7', have smaller rostrums and are tri-colored ranging from light beige to grey to darker grey on top. They travel in larger groups sometimes up to 100 and are nocturnal feeders. This brings into question the fact that when in near shore waters during the day they are often resting and that is why the practice of swimming with them during the day is controversial. Bottlenose Dolphins have a larger rostrum are 6' - 12' long and travel in smaller groupings.Their coloring is a more uniform grey than the Spinners, although pregnant Bottlenose have a noticably pink underbelly. For a more complete list of other species found in Hawaiian waters go to www.cascadiaresearch.org/hawaii A major threat to the numbers of dolphins everywhere are long line fisheries and this is the topic of ongoing international legislation. The Monk Seal, one of three warm water seals in the world, is in crisis. Numbering about 1100 individuals in the Hawaiian Islands their numbers are decreasing dramatically every year. Threats to juveniles in the North Western Hawaiian Islands from Galapagos sharks, marine debris, infectious diseases and male predation have prompted NOAA fisheries to suggest trans locating juveniles to the Main Hawaiian Island and then transferring them back to North Western Hawaiian Islands, NWH,I when they reach adulthood. This has led to controversy and misunderstanding with local fisherman. Recently in November 2012 three seals were found dead under suspicious circumstances. An investigation is ongoing. Facts that may be misunderstood is that the seals are mainly bottom feeders and are not believed to go after larger game fish like Ulua favored by fishermen. Of course if one comes across a fishing line with a juicy fish already caught they will often attempt to steal it. This of course is an age old dispute between seals and fishermen everywhere. They are protected under the Endangered Species Act but that does not cause restrictions on fishermen rather it attempts to protect monk seals from being slaughtered and eventually becoming extinct. These seals have been around for millions of years their extinction from the Hawaiian Islands in just a few years would be tragic.